← When Johnny Comes Marching…. A Christmas card for a 5-year-old, but still, Santa made me feel good. 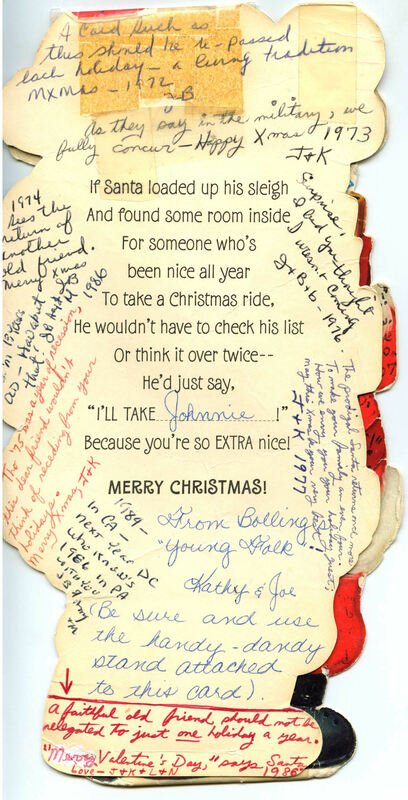 I decided then that Santa would return to his sender the following year to wit: “ A special card should be passed along each holiday – a living tradition for Xmas – 1972 – J&B.” I was married by then) and in flight training in the F4 Phantom fighter in Arizona. 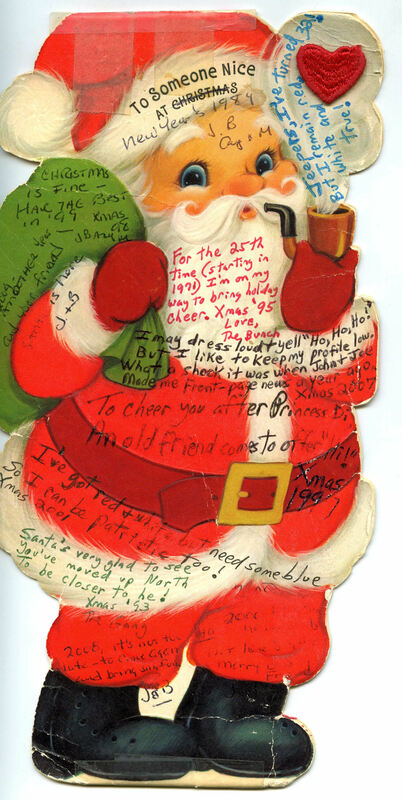 Santa came to me in 1973 in Udorn Thailand, where I had spent part of the year flying combat missions. After commenting on more than 40 years of births, deaths, moves, retirements, and even Y2K, Santa is creased, and wrinkled, with some yellowing tape to hold him together. He barely has a spot left that isn’t covered with greetings, but hasn’t stopped. I surmise, that he will find a way to continue for many years to always have the right words to say. And once again – in 2014 he was sent on his merry way for another year, but he didn’t return in 2015 as my old friend had passed on. I learned this in 2016 when I googled his name and found an obituary. That might have ended the tradition, but google led me to locate his former wife and sons, one of which had the card. So last December Santa came back for his last trip. In the future he will make the trip only on Facebook, and he is ok with that. He has traveled enough. This entry was posted in Air Force, Alaska, American History, American holidays, Anchorage Alaska, Christmas, Christmas Card traditions, Christmas Cards sent back and forth, Family History, Norvell Family History, Social History. Bookmark the permalink.